1952 Gibson introduced the Les Paul Custom - Gold Top - Rosewood Fret board - 2 x P-90 pickups 1953 Gibson introduced it in Black with white binding to look like a Tuxedo. Nicknamed "Black Beauty". Ebony fret board with MOP block inlays and split diamond inlay on the headstock. Pickups were P-90 at the bridge and Alnico V at the neck. The frets were low and it became known as the "Fretless Wonder". 1954 The new ABR-1 bridge was introduced and the case changed from the brown/pink to a black/gold case. 1957 The pickups became 3 x PAF [Patent Applied For] humbucker pickups. 1958 Kluson tuners were replaced with Grover Rotomatics. 1960 The Les Paul Custom was discontinued and was replaced by the Double Cutaway. 1961 A small number were made with the single cutaway until the transition to the SG style body was complete. 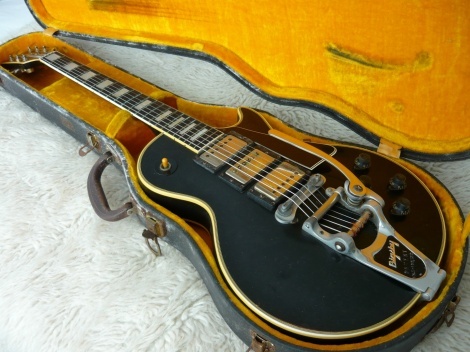 1968 Gibson reintroduced the Les Paul Custom as a 2 x pickup model.